“Acuity helps us operate more efficiently by streamlining the collection, synthesis and access of performance data from the disparate systems that support our contact centers,” stated Cindy Dossett, Performance Assurance Manager at Vectren. A subscription-based Software as a Service (SaaS), Acuity combines a central data store, intuitive business logic designer and specialized analytics engine to deliver real-time performance intelligence through customized scorecards and role-based dashboards. Communication, gamification, quality monitoring, pay-for-performance and other features are tightly integrated and accessible anywhere via web-enabled work stations, pcs, tablets and smart devices. Acuity was enabled via secure web access to every Vectren agent as well as managers, business support staff and senior leadership to strengthen contact center alignment, decision making, communication and process execution. To schedule an Acuity demo and performance management needs assessment, complete the registration form here: http://www.touchpointone.com or email TouchPoint One sales at info@touchpointone.com. TouchPoint One is an innovative provider of contact center performance management solutions. The Company’s Acuity product is a hosted software solution (SaaS) that combines a central data store, intuitive business logic designer and specialized analytics engine to deliver real-time performance intelligence through customized scorecards and role-based dashboards. 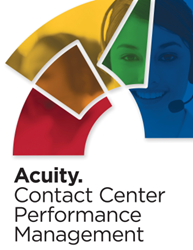 Acuity provides a single platform for improved contact center decision making, communication and process execution to achieve greater customer, employee and business success. Vectren Corporation is an energy holding company headquartered in Evansville, Ind. Vectren’s energy delivery subsidiaries provide gas and/or electricity to more than 1 million customers in adjoining service territories that cover nearly two-thirds of Indiana and west central Ohio. Vectren’s nonutility subsidiaries and affiliates currently offer energy-related products and services to customers throughout the U.S. These include infrastructure services and energy services. To learn more about Vectren, visit http://www.vectren.com.